Nasca is a town about 450 km (230 miles) south of Lima (6 hours by bus). This is the region of inhabitancy of pre-Incan Nasca civilization that flourished in the area from ca. 1-750 A.D.
Nasca people were engaged in wars and traded but their main activities were fishing and agriculture. At the same time Nasca were wonderful artists and architects – we can tell from the pottery and ruins of the ancient cities belonging to this culture. There is significant evidence indicating the high development level of this civilisation, the main being the Nasca Lines - series of enormous geoglyphs located in the desert and visible only from high above the ground. Enormous geoglyphs in the desert in a form of animals and various objects – Nasca Lines – were discovered in 1926. 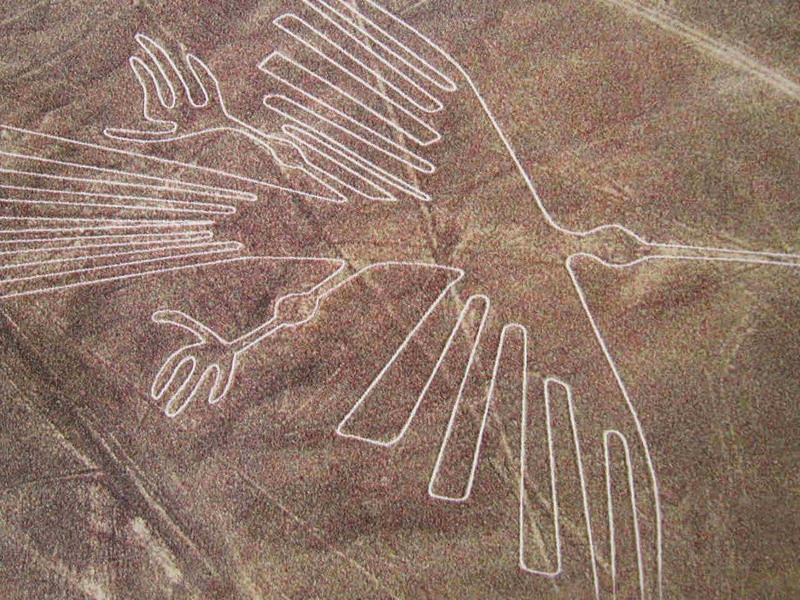 Scholars believe the Nasca Lines were created by the Nasca culture between 300 and 800 AD. They were called “the largest astronomical calendar of the world”, "the world's largest astronomy book". The real purpose of these lines is still unknown. The area encompassing the Nasca Lines is nearly 500 square kilometres (190 sq mi), and it is located in the one of the driest place on Earth (averaging only thirty minutes of rainfall per year). This weather keeps the lines uncovered and visible to this present day. For the first time these pictures were described in 1548, but nobody was paying serious attention to them. Maybe because these lines are visible only from air and flights over the desert started considerably later. In the early 1940s, an American professor was invited to study the hydrology of a coastline for the construction of Panamericana Highway and was frequently flying over valleys in small planes. He was the one who paid attention to the strange lines forming enormous figures. He became fascinated with the lines. Professor Kosok and other scientists spent decades studying these lines. They could find the connection between the location of the lines and the sun during summer and winter solstices, as well as the indications to the moon, other planets and celestial bodies. It seemed that the Nasca civilisation built a huge observatory here. The construction method of geoglyphs was very simple: the lines were made by removing the reddish-brown iron oxide-coated pebbles that cover the surface of the desert. When the gravel is removed, it leaves a shallow trough and the light-colored earth beneath shows in lines of sharply contrasting color and tone. Later the colour of the lines became darker and less contrasting, but we still can see the figures left by the Nasca Civilisation. 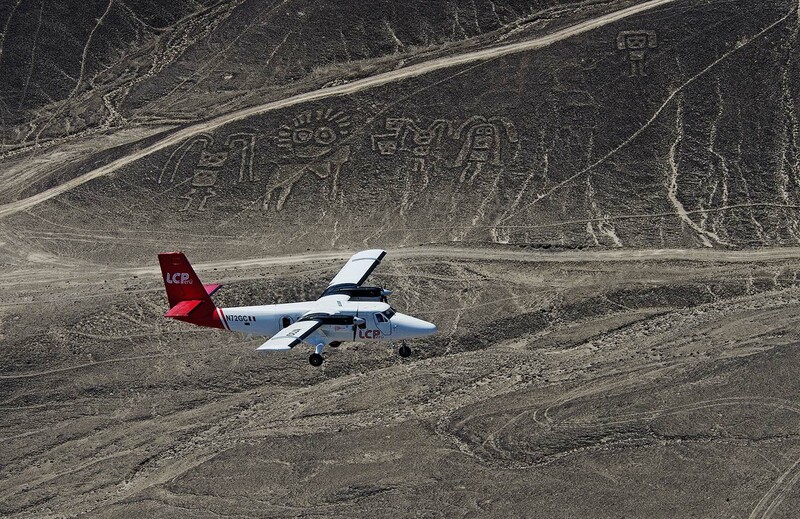 In Nasca there are several companies offering daily aircraft flights over the desert. The cost of such tour is 60-90 USD. Alternative way is to climb the platform built next to the Panamericana Highway (El Mirador). The cost of climb is 2 Sole (0.8 USD), but you will see only 2 figures. There was a necropolis near the city where the scientists discovered intact burials with various items that were usually put into the graves (pottery, cloths, ornamentals, etc.). All discoveries are displayed in the Archaeological Museum Antonini (Museo Arqueológico Antonini) in Nasca. Chauchilla Cemetery located 30 km (18.6 miles) south of the city of Nasca in Peru. It is the only archaeological site in Peru, in which ancient mummies are seen in their original graves. This cemetery had been used for a period of anywhere between the 3rd and 9th century, but the most important burials belong to 600 – 700. The bodies are remarkably preserved due mainly to the dry climate in the desert but the funeral rites were also a contributing factor. The bodies were clothed in embroidered cotton and then painted with a resin. The resin is thought to have slowed bacteria trying to feed on the bodies. The cemetery was discovered in the 1920s, but was officially recognised as an archaeological monument and protected only since 1997. For many years the Chauchilla Cemetery was looted by treasure hunters, who destroyed the place completely, taking away all the treasures the mummies kept in their tombs for centuries. Nasca was very advanced civilisation. The farmers of Nasca needed a system to irrigate dry lands that lacked surface water and the rivers had water only 40 days a year. They solved this problem by developing a wonderful system of underground aqueducts. Thus, they were able to have water all year round. One of these Cantalloc Aqueducts (Cantayoc) is located less than 5 км (3.1 miles) from the modern city of Nasca and consists of a set of wells that spiral down to the level of the running water.